1. What is a Relocation Coach? Relocating is challenging, both emotionally and mentally. 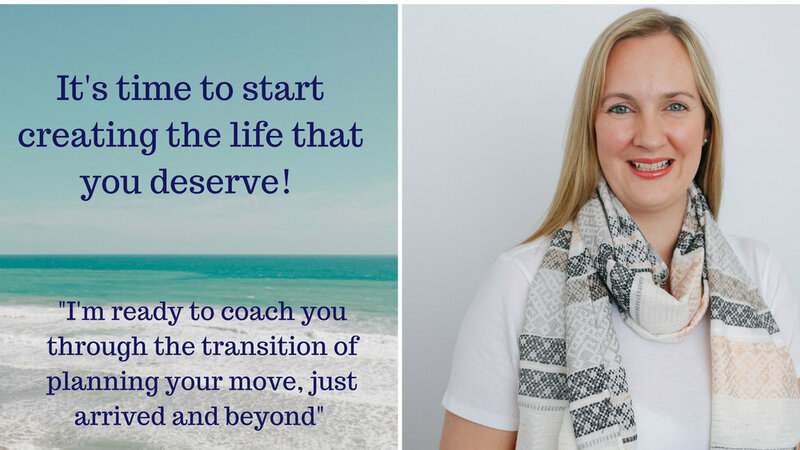 My role as a Relocation Coach is to offer you support and help you re-establish your life in a brand new location. Yes, you are right, a good friend or a caring spouse could do that, but only if they are trained to work with people, have experienced multiple relocations themselves and learned a lot from them and are willing to commit 100% to your success at a new place. I love helping courageous women to create the life they want in their new location. I support women moving internationally or interstate. Also, you may need someone impartial to the whole situation, and that is where I step in. I know when I have relocated having some unbiased support for the entire process is priceless! Let's get you back in the driving seat and take control of your life! I have overcome many of the personal challenges that living away from home presents and now I want to help you overcome your challenges! 2. What do we cover in the coaching sessions? Our coaching sessions focus on YOU, and I bring my great listening ears! You can expect confidential, non-judgemental environment. I do not have a strict regime when it comes to my coaching style. My first task is to get to know you better. To do so, I will ask you some questions, using powerful questioning techniques to get to the bottom of your most significant challenges and fears. I coach courageous women who are planning a move, just moved or beyond. I will use specialist coaching tools to calm you down and empower you because you ARE stronger than your challenges and fears. Also, if you allow, I will share my own experiences with you. Next, we will get to work and create an action plan geared towards getting you a step closer to your overall wellbeing. Together, with my guidance, you will decide on your goals. Not just any goals though, but S M A R T goals. I will follow through your progress, holding you accountable for achieving your goals and support you along your journey towards making them. 3. How will the coaching sessions benefit me? Instead of feeling uncertain about your future, anxious and overwhelmed, working with me will enable you to take control of your life. People who surround you may not realise how exhausting relocating is. But I do. So you will be able to talk to (or just rant) to someone who gets YOU. Your life will change for the better in less time than if you were on your own. With my encouragement, accountability and support, you will save precious time. 4. How much are the coaching sessions going to cost me? Coaching is a personal investment for YOU (is this not priceless?). The length of time you wish to have coaching sessions will depend on your individual needs. Send me over an email or book a call with me. I am flexible to your circumstances! I've moved many times myself, so I understand how hard it can be, especially on the finances. Let's not make money the reason we don't start creating the life that you deserve. I do frequently offer discounts and payment options. If you feel my coaching can benefit you, please contact me so we can discuss payment options further!